I’ll have a little extra help tomorrow when I’m running the Twin Cities Marathon. I will be Powered By Shep. Shepard Kelly is the two year old son of one of my brother’s high school friends, Jennifer (Bawcom) Kelly. On August 21st of this year he woke up not feeling quite like himself. After 2 days of testing, the doctors diagnosed him with Leukemia and he immediately began what will be a 3 year course of chemo. Within the past week or so Shepard was classified as high risk, because some of the numbers on his latest test weren’t within the range the doctors had hoped they would be. Shep’s mom runs marathons. I remember last year my brother told me his friend Jennifer had a finishing time that would have put her and I crossing the finish line within seconds of each other. 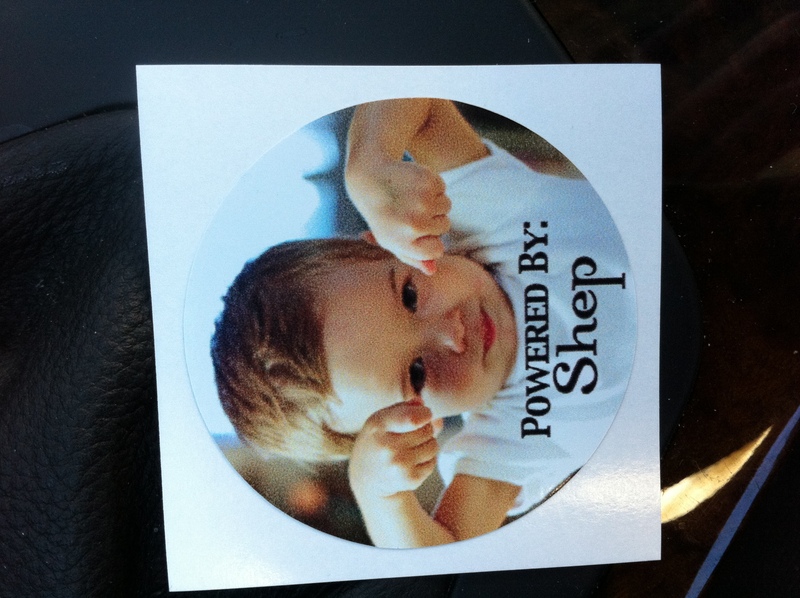 Some friends of theirs are running Twin Cities on Sunday and, through Shep’s caringbridge website , they put the word out that anyone that wanted to be Powered By Shep for the marathon should contact them for a sticker. 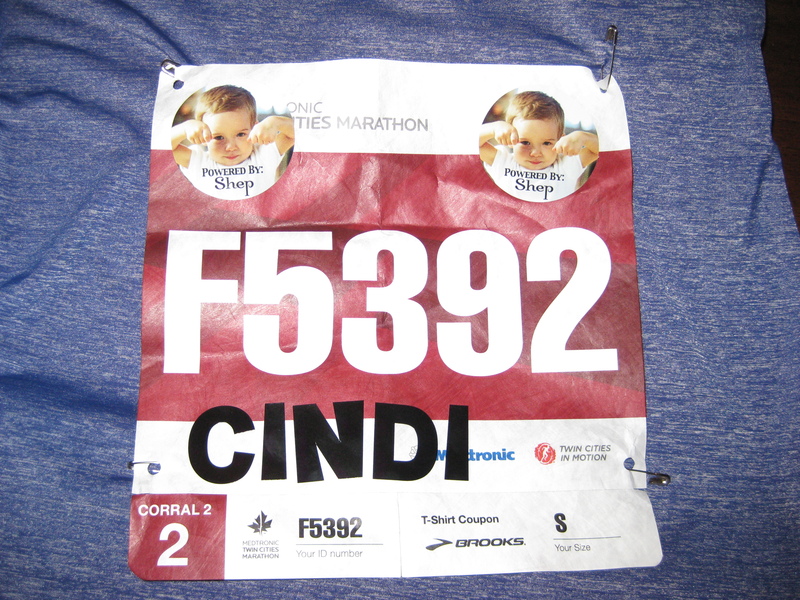 So my bib is all decked out with pictures of the little guy. If this little 2 year old can withstand daily doses of chemo, with a smile on his face and a spring in his step, then I can power my way through 26.2 tomorrow. I am honored to be a part of Team Shep and will be thinking of Shepard, his parents Matt and Jennifer, and his big sister Beela when I run tomorrow, wishing blessings and good days ahead for little Shep. today. Congratulations!!!! I hope you are doing a happy dance! Tina! Thanks! I thought of you too and was hoping you were having a great day. Saw that your time was off where you wanted to be. Did you get injured? Or the heat get to you? You still have NYC Marathon in a month! YOU are the inspiration doing marathons two months in a row!